Shows » Have You Ever Seen a Pink Gull? Have You Ever Seen a Pink Gull? Some gulls and terns may show a glowing pink color, similar to that of flamingos and spoonbills. This pink color comes from pigments in the birds' food called carotenoids. These gulls and terns are able to convert these naturally occurring pigments to hues that may enhance their success at attracting a mate. BirdNote listeners are taking a once in a lifetime journey to the Galápagos, and you can join us in July 2018! Trip details and more at Birdnote.org. If we think of pink birds, flamingos and spoonbills might come to mind. But gulls and terns can also have glowing pink breasts. 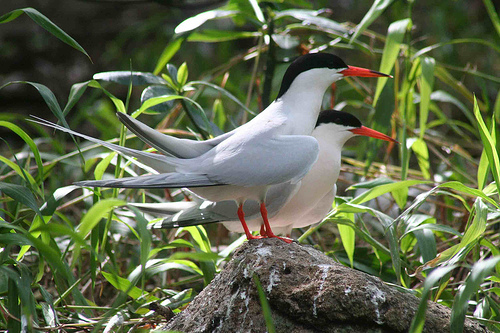 We picture these seaside birds decked out in their standard colors of gray, white, and black. Yet several gull and tern species greet spring with a rosy blush on their breasts. Franklin's Gulls, flying north to nest in the prairie wetlands, glow reddish-pink below—flashy enough that in the 19th century, the bird was known as "Franklin's Rosy Gull." The Laughing Gull, common along the Atlantic and Gulf coasts, may also show a suffusion of pink. The pinkest of all of this group are Roseate Terns, which have some pink all year, but reach their showiest at the start of the breeding season. This is true of all pink-breasted gulls. The rosy glow, present in both males and females, may signal that the birds are physiologically ready to pair up and begin breeding and nesting. That pink blush ultimately comes from pigments in the birds' food called carotenoids (pron: kuh-ROT-un-oids). These gulls and terns are able to convert these naturally occurring pigments to hues that may enhance their success at attracting a mate — and help foster the next generation of the rosy-breasted. Bird sounds provided by The Macaulay Library of Natural Sounds at the Cornell Lab of Ornithology, Ithaca, New York. Recorded by Paul Marvin and Bob McGuire.